Saturday, May 12th, I went simploring again. 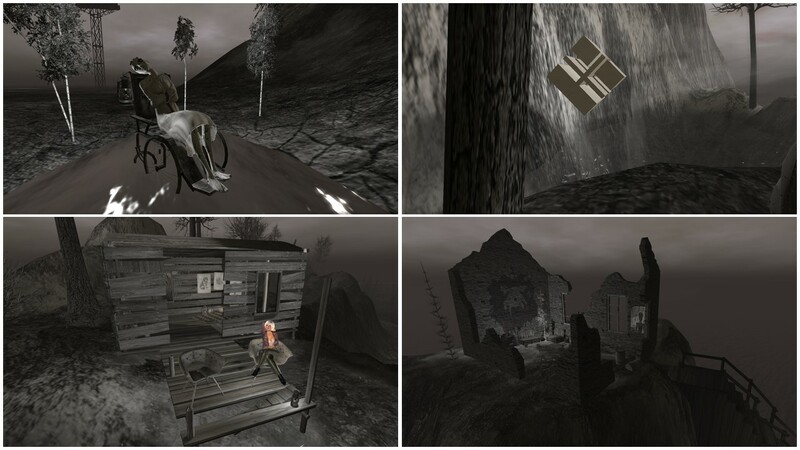 I picked “2ᴇʟᴡƎ“, a homestead designed by Miuccia Klaar and Squonk Levenque, from scoop.it SL Destinations. I also read two blog posts about “2ᴇʟᴡƎ“, one from Kate Bergdorf titeled “2ᴇʟᴡƎ” (read here) and one from Maddy Gynoid “Simtipp: 2ᴇʟᴡƎ” written in German (read here). In fact there is a sofa, a few trees and a phone and the phone gives you the above mentioned notecard. The notecard contains no information about “2ᴇʟᴡƎ” itself, it recommends to keep the sim’s windlight settings and proposes a few alternatives. From the skyplatform you come through a trap door and a long tunnel to the sim itself. 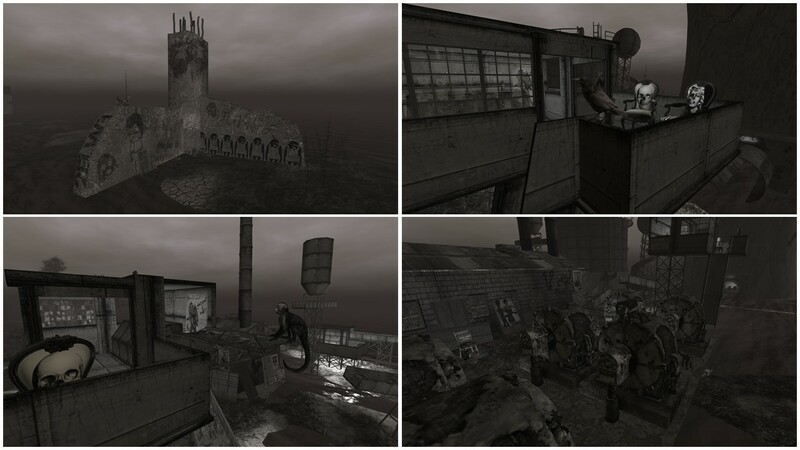 “2ᴇʟᴡƎ” is a sim in grey, just like an old film in black and white. The atmosphere is particular and it rains at many spots. 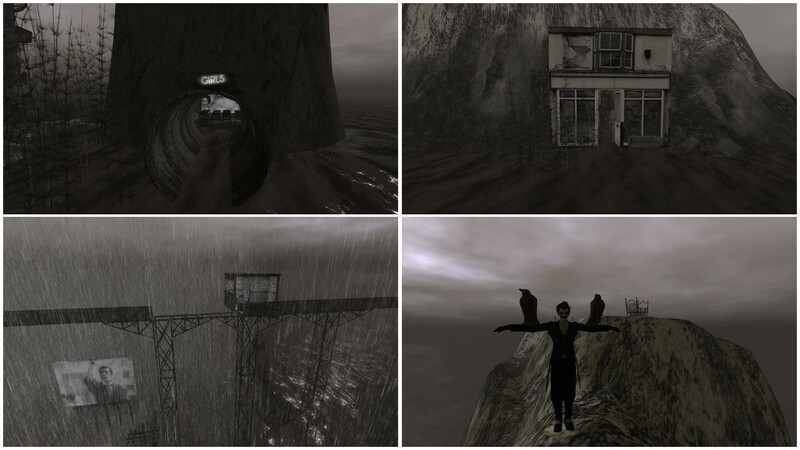 The rain is an important style element at “2ᴇʟᴡƎ” and alternates between a few drops and heavy rain. In the middle of the sim is one straight road lined with telegraph posts. At one end is a billboard showing the start sequence of an old film counting back from 8 to 0 and then fading into the word “2ᴇʟᴡƎ“, at the other end is the ending sequence of an old film showing a man who pulls down a screen with the word “The End”. Along the road you’ll find 2 installations, one with 12 brids and one with 12 dolls. The dolls are quite impressing, they have a darkended forehead and do look upwards into the sky as if praying. Along the road are more billboards all showing very short scenes of an old movie. The straight road parts the sim in two halfs. One half has some mountains and you can find litte spots with other art installations within the mountains. You can even sit there at several places and watch the scenery. “2ᴇʟᴡƎ” can be pronouced as “twelve” and the number 12 plays obviously an important role at the sim. 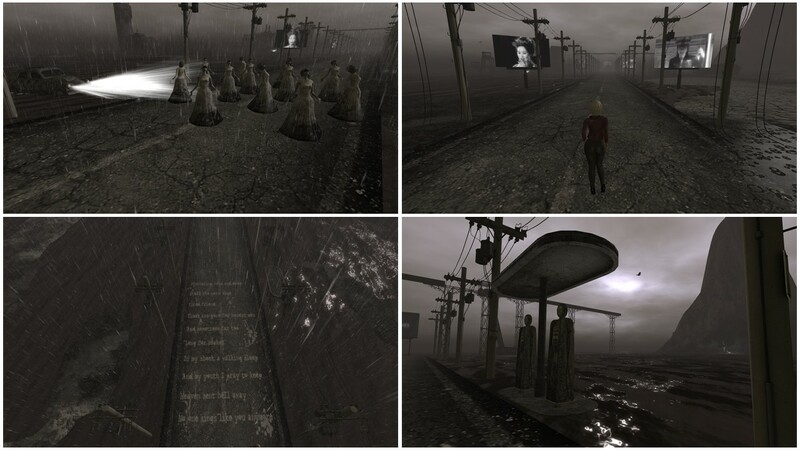 Kate Bergdorf suspects in her blog that the sim is a reminiscence of the movie “12 Monkeys” (read here in wikipedia). I’m no cineast and I didn’t see this movie, hence I can’t judge. The 12 birds though reminded me of Alfred Hitchcock’s birds. “2ᴇʟᴡƎ” is impressive because of it’s dense and scary atmosphere, it’s surreal, yet it is fantasic for taking artful pictures. I enjoyed my visit. Thank you, Miuccia Klaar and Squonk Levenque for providing this piece of art for us all.